It's our last day of the My Creative Time "12 Days of Christmas"! It's been a lot of fun, and I hope you've been as inspired as I have with all of the projects that have been shared by Emma and the rest of the design team! If you arrived here from Jeanne, then you are headed in the right direction. If not, please start at Emma's blog here. Emma's got lots of fun news today, along with an AWESOME giveaway!!! For my project today, I made sour cream containers filled with some treats for my students. These are very easy to make and just perfect for when you need to mass produce. If you've never made these or seen them made, you can watch my video below. To make 20 of these, I only needed 5 sheets of 12 x 12 cardstock. Not bad! 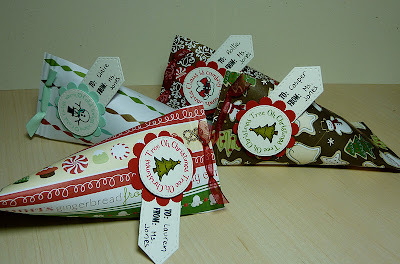 To decorate each one, I used Emma's Scallop & Stitched Circle Dies, along with her Build a Banner Kit for the "To/From" tag. The sentiments and images on the stitched circles are all from All Around Christmas, and the "To" and "From" are from Classmate Valentines. I love that Emma has included To/From on several of her stamp sets, each in a different size and style. There is one for every project! There is even a perfect sentiment for my students who don't celebrate Christmas. My Creative Time "Scallop & Stitched Circles Dies" & "Build a Banner Kit"
To qualify for ALL of the AMAZING giveaways for the 12 days, you must comment on every blog in this hop! You will have until Tuesday, December 13th @ midnight, to post all of your comments. Very important: please leave a way for us to contact you if you are one of the winners! There are some amazing giveaways for this 12 day event and some surprises to help celebrate My Creative Time's One Year Anniversary! Yes, Emma released her first set of stamps one year ago! So make sure you are tuned in, because this is ONE hop that you do NOT want to miss!!! These are so cute. I've made the sour cream containers from toilet paper rolls and covered them with thin paper, but it's much easier with patterned cardstock. Love these, Katie! Okay, now I feel very "dirty" after watching your video!!! lol.... your stamps are "SPOTLESS" & mine are filthy!!! hahahaha! GREAT VIDEO & AWESOME TREATS! Your students are going to LOVE them! These are so very nice. Well done. Wow! I feel so sheltered as I don't know how it's been possible for me to never have heard of making "sour cream" containers and using them for anything other than, well, sour cream! Lol. How fun and cute! These would be perfect for dressing up stocking stuffers or using that as party favors. Those are too cute! Great for goodies!! Great treat holders!! Thank you for all the lovely projects over the past 12 days. Awesome, thanks for doing it on video, you make it look so easy!! Your class are going to love them, thanks for sharing all your wonderful ideas!! Super cute...love them!! I made these last year for my sister inlaws holiday table. Awesome 12 Days of Christmas...thank's!! It's bee an awesome 12 days. Thanks for the 12 days of Crafting Love. I love the sour cream containers for treats! So easy yet so cute! I just love those sour cream containers. They are so cute and so easy! Love it! My Best to you for the Holidays! 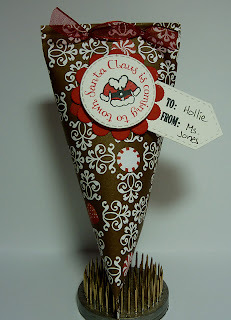 Love these sour cream containers ... the paper is soo cute :) Your students will love them too!! These are so cute. I haven't made any sour cream containers before but may have to give this one a try. Love all the papers you used. TFS! What a great way to end this fun 12 days of Christmas! Thanks for sharing these adorable projects and for all your creativity and inspiration these past 12 days!! That is super cute, and so great to see a project that you can do a large # of without breaking the bank! these are so pretty! what a great idea! and I am sad to see this come to an end!! I have enjoyed you all the past 12 days! thanks so much for sharing your ideas with us! These are so adorable. I like the little "to from" tag sticking out from the center medallion. Love this idea! Super cute! I love the paper you used. Really nice! How cute! Perfect for students. Love them! WHat a cute idea! Love these! oooooh, I think I'm going to make some of these! OK your students are super lucky to have a wonderful TEACHER like you. Wow these are so adorable. How easy this is but so adorable. Great great great job. 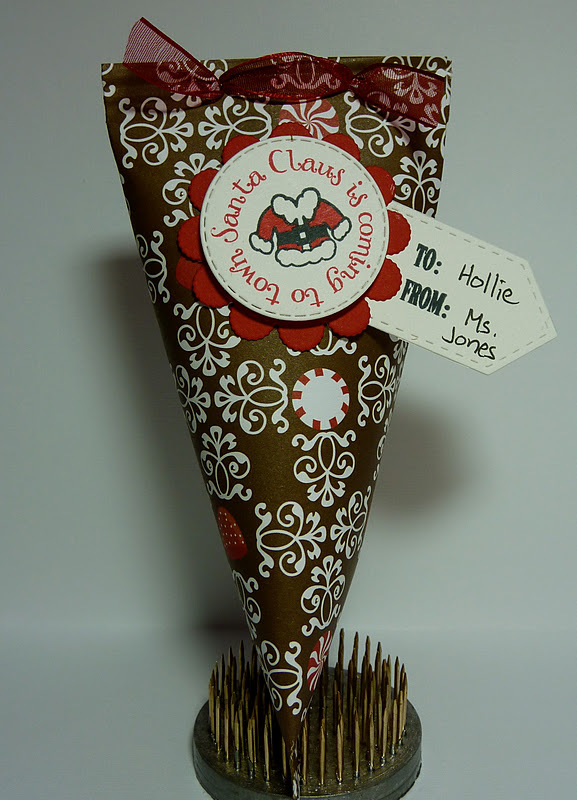 You truely are one amazing crafter and I bet your students love that too. Adorable containers! I haven't tried this cut yet, but I think I need to give it a go sometime soon! Thanks for sharing! I have wanted to know how to make these thanks for the video!! You are using my favorite stack!!! To cute!! Happy Holidays!! So very cute! I love your project for today. I hate to see this hop end, but I know it has been a lot of work for all of you! That is super spectacular, I love it, thanks for all the ideas. Those are so cute, love the papers. I love making those, they are so easy and make such cute treat holders. Love your sour creme containers! They are so cute. Wow super cute! Awesome job! Thanks for sharing! Wow!adorably cute! Love your cute project kids will love them. Wonderful treat containers! Great variety, your students will love them! TFS - this was an amazing hop! i loved this project and the paper looks fabulous. Loved all the projects in the blog hop. ooooh soooo cute! I knew they couldn't be that hard, but I have never tried them...now that I watched how to do them, you will be seeing some from me! thanks Katie for the easy instructions! Oh, I just love these sour cream containers...so super duper cute! You have decorated them so cute! I really enjoyed the 12 days of Christmas hop.....your projects were all amazing! I have not seen this craft before but you make it easy to do. Thank you. Love this idea. Your students are gonna love them. Very cute containers. Lucky students. I love your sour cream containers! They are my favorite container to make, they are just so cute!! Great idea. Thanks for the video. Your students are going to enjoy them. I'm bummed the 12 days is ending. I've enjoyed all your projects. GREAT PROJECT...LOVE ALL OF THEM...THE STUDENTS ARE GOING TO GO CRAZY OVER THESE..AWESOME!! What a wonderful gift to make for the students! Thanks for all of your wonderful ideas! Cute idea.. Love your blog.. I love the sour cream containers. I love your version of the containers! Emma's stamps and dies are perfect for so many things. Your students will love your gifts! Thank You for all the work in the 12 Days Hop. Gotta love those sour cream treat containers! Very cute! I have got to try these sour cream holders! I still have to make treats for my kiddos clas, so I'll be watching your video here shortly and hopefully, this will be what the kiddos get this year! Thanks for all of your fabulous crafty ideas during this blog hop! fantastic! I LOVE these so much! How incredibly cute are these!? I love the colors and the way you decorated them. SO CUTE!! I love sour cream containers and you did a great job. WOnderful ideas this whole hop. Aren't these great!!! I love making them and I love how your papers and the tags match up!!! Very cute project!!! Thanks also for all the great projects for Emmas 12 days!!! They've all been so great !!! Merry Christmas! very cute containers. great job. Very cute treat containers. I've really had a great time on this blog hop seeing all of the fun and creative projects the team has come up with. Super cute! Thank you for your video on how to make, I've always wanted to try these but never knew how! Love the papers you used. These are to cute. What an adorable gift idea or at a table setting. Im going to have to try these some day. I just think they are so fun and festive. I love your sour cream containers!! these are really cute, what a neat idea !!!! WOW! 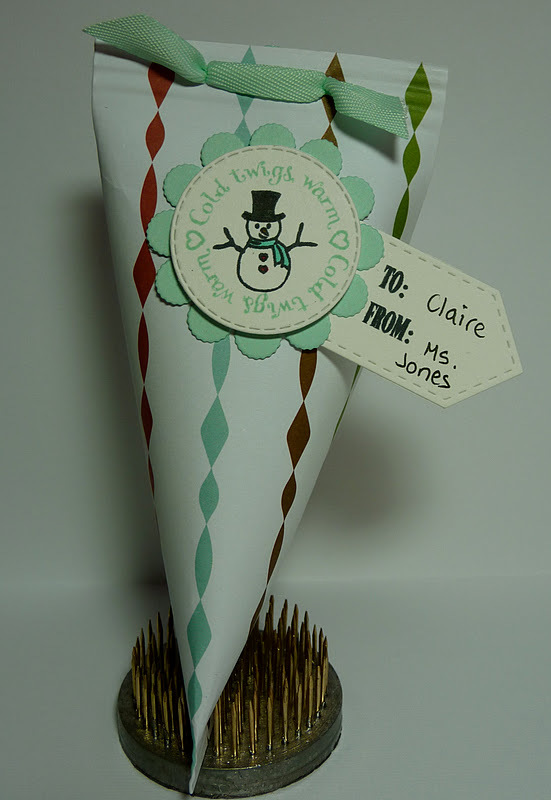 You spend lots of your time making such cute gifts for your students. Thanks for all the projects. Love these, great job. Thanks for all the inspiration with week. This is great to make for treats for the classroom! Cute treat container! Great idea! Thanks for all of the great projects you've posted the last 12 days!! Merry Christmas! Great idea, I LOVE sour cream containers. Love making these! 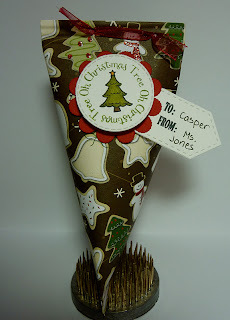 They are so easy and such a fun way to give a gift. Thanks for all the inspiration! Very cute. Thanks for a great 12 days of awesome projects. These are super cute! I am sure your students absolutely loved them. These are so cute! I know your students will love them! :) I wanted to let you know that you did an awesome job on the 12 days of Christmas and I enjoyed every minute of it! Thank you so much for all the inspiration! I hope you have a very Merry Christmas! Adorable! I love everything from the 12 days! OH MY GOODNESS!!! I love these!! these are sooo fun and super easy to make Thank you for all the inspiration over the last 12 day you did some amazing work!! These are awesome! Thank you so much for the video, love when I can learn new tricks! And thank you so much for all of the inspiration for the past few days! These are super cute. Thanks for the tutorial! Wow what a wonderful idea. I just love these. Great job!!! I love these little containers and that was so kind of you to make a video - I'm such a visual person so this helps me a lot!! These are really cute. Thank you for going the blog hop. I have enjoyed looking at all the neat crafts. Thank you for sharing your takent and ideas. Nice containers. Thank you for sharing some wonderful ideas. Very cute. Thanks for a great 12 day hop. Super super cute! Thanks for posting up a video tutorial! What a wonderful idea. TFS Thanks for the video. Thank you for all of your FUN hard Work. Love projects, thanks for sharing! Katie, I can't believe you only have 20 students! I am so jealous! Where do you live again? Anyway, great project!!!! I'm sure your students will adore them! WOW the containers are too cute and perfect for class treats! Thanks for sharing and the video! these are too cute. i love the papers you used. Oh Miss Katie, love container. I like the patterns paper that you use. Great idea. Thanks for share another project with us. your students will love these!!!! Your sour cream holders are so cute. Great job on all your projects. Thank you for sharing. Well done! Super cute projects! Super cute idea. Had to stop the video to follow along and make one! Great job the last 12 days. Your projects were awesome. Oh my gosh, these are so cute! Love how you used the crimper tool to "seal" the treat holders. TFS all your wonderful projects during the 12 Days of Christmas hop. So said it's over. :( All good things must come to an end. What a great idea. Thanks for the video and for sharing. I love sour cream containers, they are so easy to make! Your treat holders are so adorable!! Just love all of them!! your students will love these! thanks for all the great ideas over the past 12 days! Such sweet sour cream containers. I will be using this idea. I best be quick, Chrisstmas is coming so fast. Thank you for shareing. Katie I can't wait until I get home to watch your video. Love your work! Love these! So pretty- I think I'll make some for folks at work! The sourcream containers are super pretty! Thanks for the tutorial. Super cute, I made these as wedding favors. Thanks for sharing. Really cute love the papers !! Such cute, cute containers - love them! The kids will love them. Oh thank you so much for the tutorial, I have marked it as a favorite so I can come back and watch it again! I love those sour cream holders. I used them last Christmas and the year before for our advent tree decoration. This year I mixed it up a bit, but they are wonderful. So cute! I've never made these, but you have inspired me to try one. I really need to try & make these! They are just adorable, between the papers & stamps you used, just too cute!!! Katie, I'm sorry I wasn't able to comment on all your posts. I did see all of them though & of course they were all fabulous!!! I may have to do some scraplifting..lol Your dancing trees cracked me up!!! DEF gonna put this in my faves, what a great idea! Thanks! I love these. Great little gift ideas. These are so cute. I need to give them a try. Cute sour cream containers! These are fun to make and give out. TFS. I love making these - great job! These turned out sooo cute...I have never tried these before, but I must!!! These are really really cute!! I have always wanted to make those darn sour cream containers but still haven't tried it. I am feeling inspired now! Thank you so much for sharing your amazing talent with us these last 12 days.. I am in awe of your creativity! Monday Hop with EAD Designs!